When I'm reading something about jet engines, it's common to see references to N1 and N2. I've never fully understood what N1 and N2 are on engine instruments and how they relate to thrust and the position of the throttle. Conceptually, N1 is the fan (or, fan speed) and is most related to your thrust (since the fan produces more thrust than the core on today's big motors). The N2 is the engine core, and the N2 gauge is used mainly during engine start: on initial starter engagement, the N2 starts turning first, and things like adding fuel+ignition and then later disengaging the starter are based on specified N2 speeds. As long as you have N1 rotation before lighting the engine off, N1 isn't all that important during the start. But once it is running, power is generally set with reference to the N1 (or fuel flow or EGT or EPR) rather than the N2. 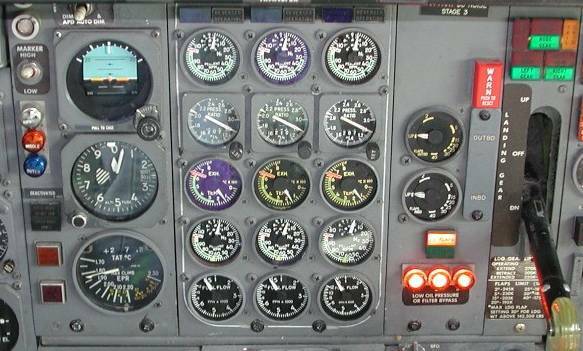 This picture of 727 instruments shows, from top to bottom, the N1, EPR, EGT, N2, and Fuel Flow indicators. You can tell (hopefully) how the N1 and N2 are both tachometers, showing percentages instead of values, because it's a lot easier to talk about 52% N2 than 6350 N2 RPM. The picture below shows an example of the engine stack displayed on a modern EICAS panel, with the N1 and the EGT displayed prominently, and everything else just shown as digital values (with no EPR indication in this aircraft). This is a typical in-flight presentation, showing you the two things you most care about with large displays, and everything else available if you really need it. N1 and N2 are the rotational speeds of the engine sections expressed as a percentage of a nominal value. It is similar to the revolutions per minute (RPM) of a piston engine, expressed in percentage instead of in the actual rate of rotation. They are different because they are characteristic on two-spool engines (see the figure below). The first spool is the low pressure compressor (LP), that is N1 and the second spool is the high pressure compressor (HP), that is N2. The shafts of the engine are not connected and they operate separately. It's dependent on the aircraft and engine installations but these refer to the rotation speeds of the engine spools. As listed above, usually the N1 refers to the spool which the fan and LPC/LPT are on and N2 is the HPC/HPT spool in the gas core. The displayed values for N2 and N1 are often given as percentages of their maximum rotational speed. Therefore the HPC spool will often display as running much faster than the LPC/Fan spool. This isn't always the case; For instance the engine speed gauges in the Aero Vodochody L-39 display the HPC spool as '1' and the Fan/LPC speed as '2'. Not the answer you're looking for? Browse other questions tagged jet-engine flight-instruments or ask your own question. 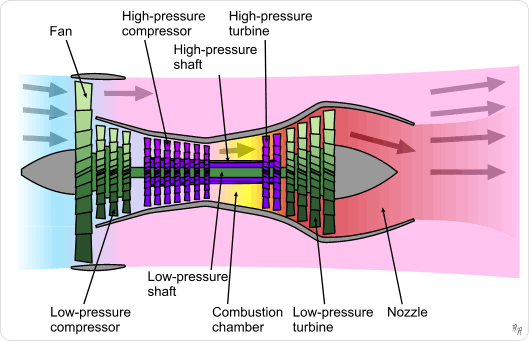 What is significance of N1 and N2 in Jet engine? Is N1 and N2 and any N speed the revolutions per second for the rotor blades of compressors? Why are all engines identical in typical commercial airplanes? How do pilots set the exact amount of thrust needed for a reduced power takeoff? What is the meaning of T/O Thrust => TRQ / N1 in a flight log? How are jet engine RPM cycles used to monitor LCF life? Turbo-fan idle at high speeds, will air speed up fan speed? What are the specifications for the CFE738-1-1B? What makes a smokeless jet engine?